Could Ealing Become a Mini-Holland? Ealing Council is bidding for £38million to try and turn the borough into a Mini-Holland. The money from the Mayor's scheme will be given to four outer London authorities to help them become as cycle-friendly as their Dutch equivalents. Most of London’s cycling growth has taken place in inner London, but more than half of all potentially cyclable trips are in outer London, according to TfL research. The vast majority of trips in the suburbs are less than two miles, around ten minutes by bike, but are currently mostly made by car. Ealing's plans, which have been laid out in this document, include major road and bridge improvements, better cycle paths and more money spent on parking hubs, workshops and cycling in schools. 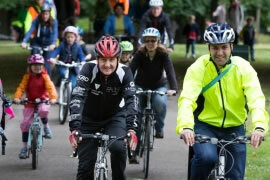 As part of the campaign to convince the Mayor to look favourably on Ealing's bid, Council Leader Julian Bell will lead cycling enthusiasts on a ride from the Town Hall to City Hall ( Wednesday, 17 July). The cycle ride leaves the Town Hall at 8am and Cllr Bell is inviting confident cyclists to join him on the ride to show their support. GLA assembly member for Ealing and Hillingdon, Dr Onkar Sahota will receive the group at City Hall. The selection process will take several months. Candidate boroughs who are unsuccessful in a bid may still be eligible for funding under different programmes for aspects of their proposals which interest the Mayor’s team.